Marquis Los Cabos luxury resort, in Baja California Sur, Mexico, offers its guests the most exclusive popsicle they’ve ever tasted, priced at 1,000 US dollars. So what makes a simple popsicle cost so much money, apart from the chance to savor poolside in one of the most beautiful places on Earth. Well, rich people tend to have a soft spot for gold, so the world’s most expensive popsicle contains 24 carat gold and Tequilas Premium Clase Azul Ultra, a special brand of tequila which sells for $1,500 a bottle. 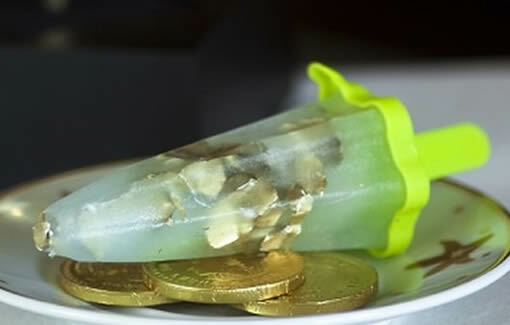 The frozen treat is served poolside, on a classic plastic stick, with some gold chocolate coins. Although salt would have been much more appropriate for a tequila popsicle, this one contains sugar, to take the edge off. If you don’t have a sweet tooth and real gold flakes don’t impress you enough to throw a whole grand on a popsicle, the guys at Marquis Los Cabos will gladly serve you a simple shot of Tequilas Premium Clase Azul Ultra for a mere $500.